The day began with a normal trip to the gym to work out to do my regular cardio and stretching routine and josh with fellow gym advocates. 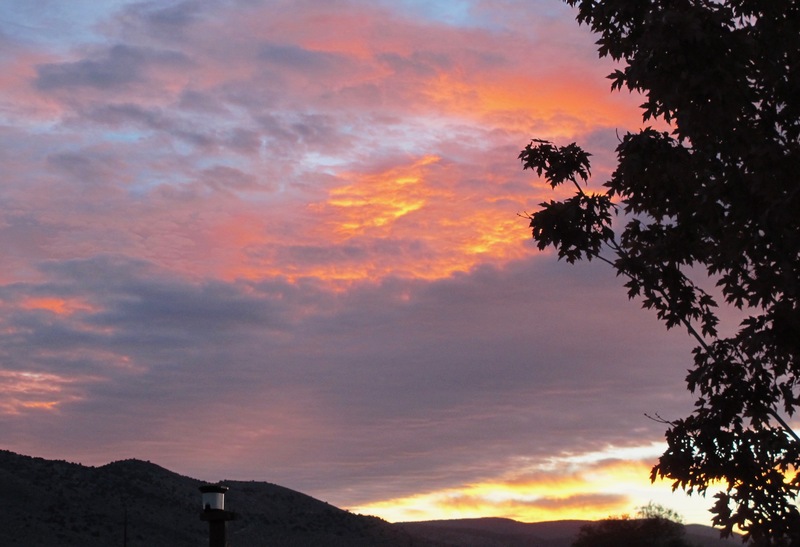 Dawn was approaching as I wended my way home on Hwy. 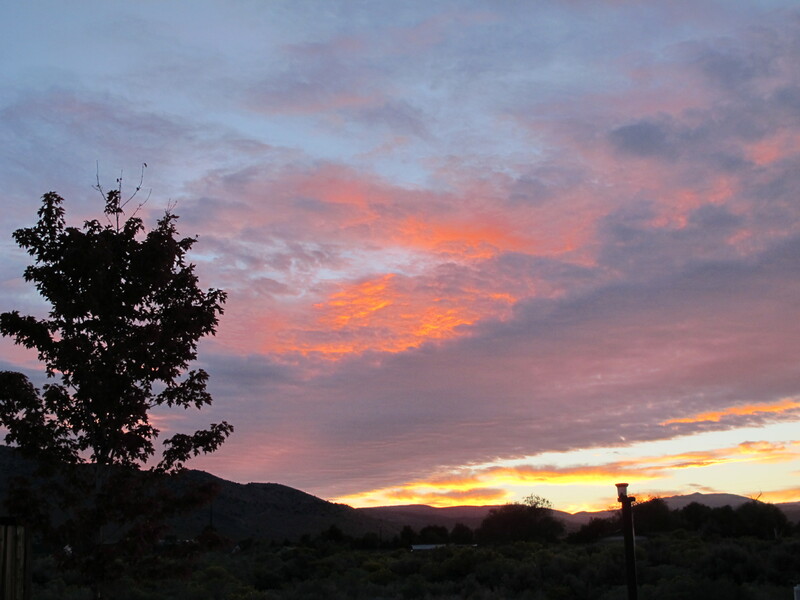 395 and I could tell that it might be a nice sunrise. I especially like this one taken a few minutes later because it reminds me of pictures I’ve seen of lava streams going downhill on the Big Island of Hawaii. 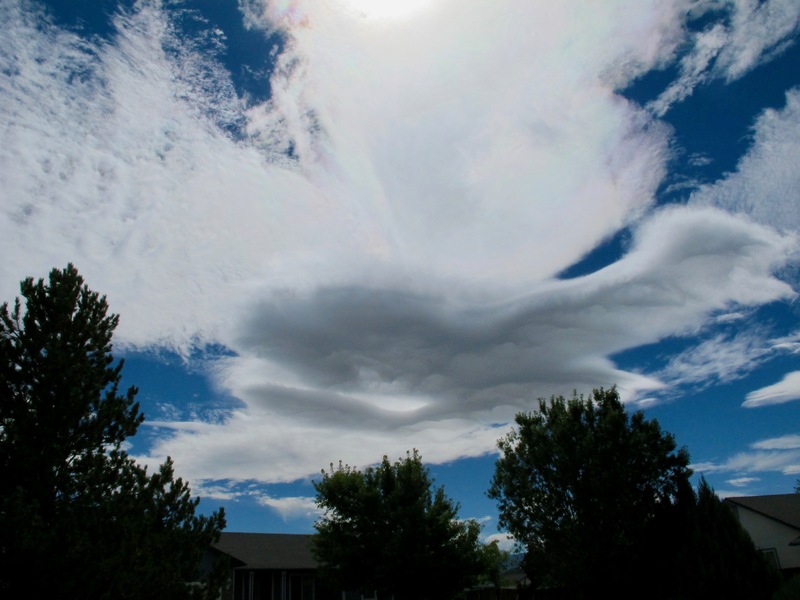 Later that day the wind was blowing at a good clip when I went to get my mail and these are the scenes I saw of some big lenticular clouds. 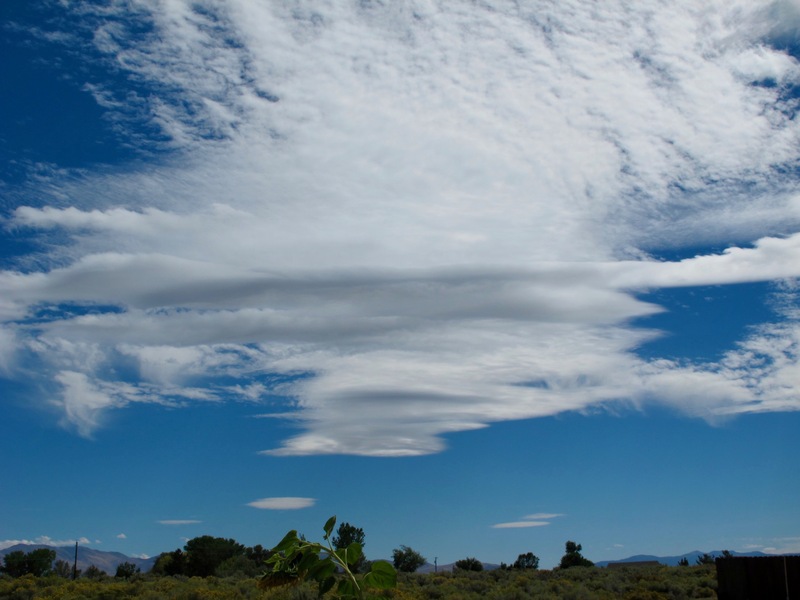 Usually these clouds remind me of humongous UFOs or the USS Enterprise from Star Trek, but these were a bit different. 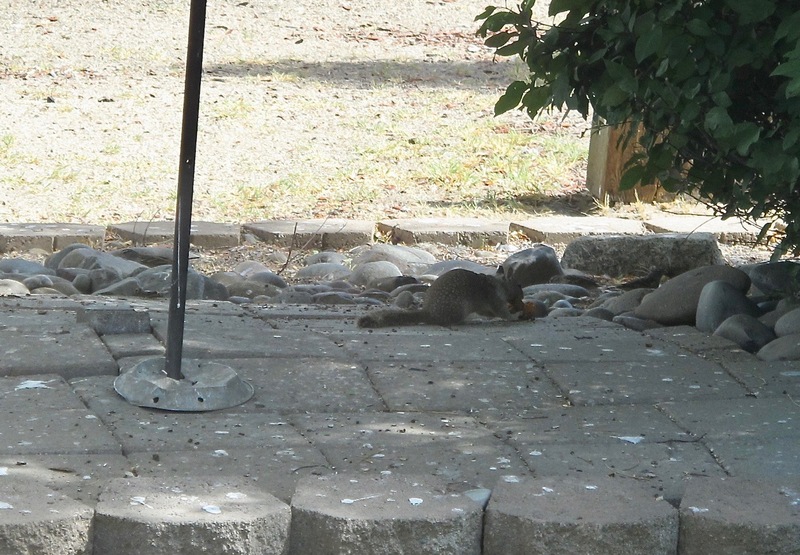 The funniest visual treat that afternoon was when Sid Squirrel came to visit the feeding station. He is named Sid because my good buddy, Shirley Porter in Grand Junction, knew a guy who was actually named Sid Squirrel. This Sid is a regular ground squirrel who frequents my property (along with his buddies and family). They are not my favorite because they are food hogs and eat way more than their share whereas the smaller squirrels and the birds eat a normal amount of their treats. I watched him look up to see the actual bird feeder and then shinny up the pole like he is a cross-fit advocate. 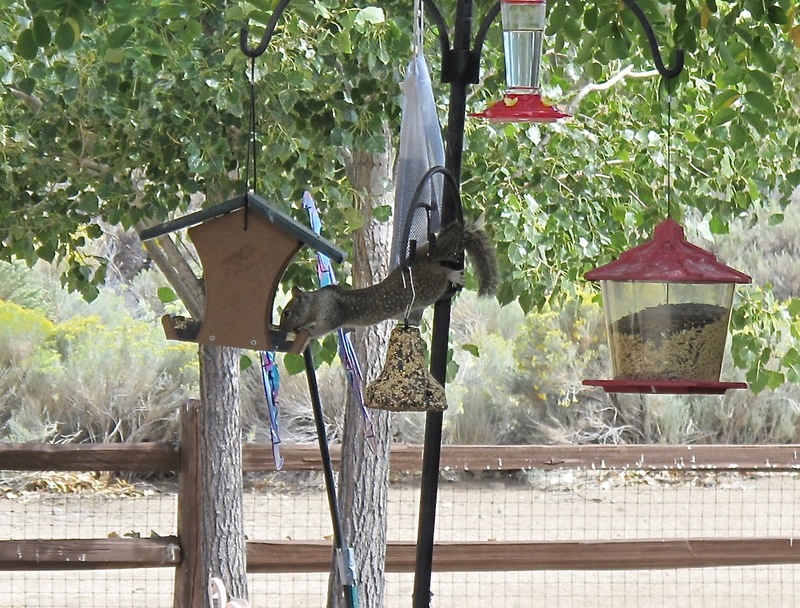 Here he is stretched from the pole to the feeder. Sid is quite an acrobat! 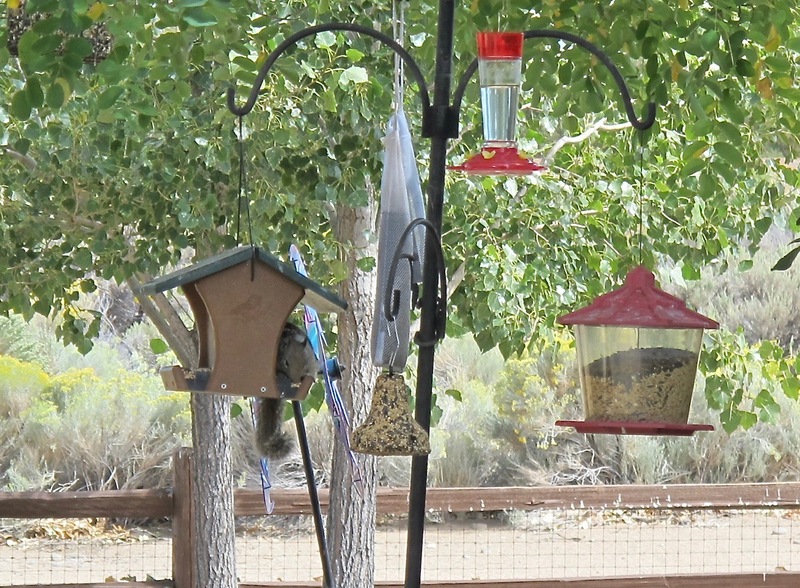 Then Sid jumped to the actual feeder to begin stuffing himself. His cheeks looked like he had a terrible case of mumps. I told Sid in explicit terms that he knows he’s not supposed to be there and with that, he jumped back to the pole, slid down it like a fireman and ran off to the sagebrush in back of my fence. I know I enable Sid and his cohorts with the buffet I put out for the “birds” and that I sort of ask for them to be invaders. But the entertainment factor far outweighs the bad parts. I wish you could see the male quail chest bumping chests and sparring with each other. One evening I was watching about 10 of the quail eating and scratching around a 12 pound seed block when all of a sudden several of the males began chasing each other back and forth like Keystone Kops in a classic chase scene. A cottontail rabbit was also with the birds at the block and finally he climbed up on the seed block and watched them. I could see his head moving from side to side as these quail put on quite a show. Sometimes I just laugh out loud at the antics of my critters. There are many visual treats available here in the Carson Valley and even in my back yard…one just has to be patient and watch for them.